Sure Point Exteriors is not just in the business of providing the physical labor part of the job, we are also educators. For instance, we like to teach homeowners about the importance of replacing old gutters with a new system. There are many important tasks involved with exterior remodeling, and gutters in Kansas City is one of the most important ones. Your gutter system is there for a very important reason. Without them, rain water would spill from your roof directly to the area around your home. This would begin to pose a threat to the foundation of your home. 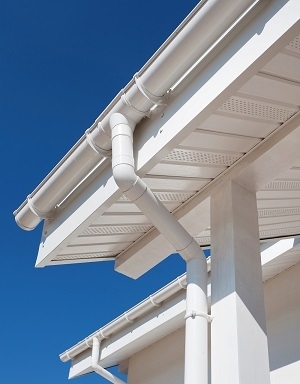 Your gutters carry the water to the downspout and then transport it away from your home. So if you do not have gutters or have outdated gutters in a state of disrepair, you are putting the structural integrity of your home at risk. Let us provide you with a way to help change all of that. From gutter replacement to installing top rated James Hardie siding to repair wood rot caused by a lack of or faulty gutters, Sure Point Exteriors is the company you can count on for all your exterior home improvement needs in the Kansas City area. There are other reasons gutters are essential. Preventing erosion and avoiding costly back splash damage are two others. Either way, the important thing is realizing that you need a system in place. What often happens is a homeowner sticks with the gutters that came with the house. With so many other things to change or fix, it can be easy to ignore this. The problem is that this can lead to big troubles down the road so it is simply easier to take care of getting new gutters as quickly as possible. We can help you by showing you the many types of gutter systems that are available, all top of the line quality. Seamless gutters with systems to help keep leaves out mean less cleaning and less trouble with leaks or other repair needs. But we cannot get started until you give us a call. Keep in mind that this new gutter system helps preserve the condition and value of your home. However, one of our superior quality systems can even help increase your property value. So give us a call today to get started. Gutters can overflow, get clogged with leaves or have problems with ice damns. All things the average homeowner overlooks. That is until something goes wrong as a result of issues with your gutters. Gutters can have bigger problems that just leaks too! They can sag and eventually collapse or pull away from the house and take the whole system down. Getting a high quality gutter system in place can help prevent this, so let's help you update and upgrade now! Sure Point Exteriors is proud to be the top choice for local gutter installation and replacement services. Now, we look forward to working with you. We will make the entire process as simple as possible – all you have to do is show up! Call us for an estimate on new gutters or any of the services we offer for exterior remodeling in Kansas City and the surrounding areas. If you are interested in an estimate for gutters in Kansas City or the surrounding areas, please call 913-203-8812 or complete our online request form.